What’s the point of art if it’s just sitting in a wasteland of obsolescence, spending 30 years languishing on dusty floppy disks? Luckily for fans of Andy Warhol, a set of images, doodles and photos made by the artist on a Commodore Amiga computer 30 years ago will is now seeing the light of day in a technological era. The Andy Warhol Museum now has the recovered art, a product of a partnership between Warhol and Commodore Amiga, after an artist happened to watch an old YouTube clip showing Warhol using the computer to create a portrait of Debbie Harry, reports The Verge. 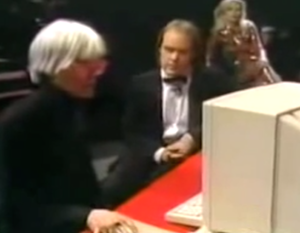 In the video from 1985 at the launch of the Commodore Amiga, Warhol sits down and sets about tweaking an image of Harry. That piece wasn’t lost, however, and had been kept at Andy Warhol Museum in Pittsburgh. The rest of his computer works weren’t so lucky, sitting on floppy disks for decades. When a new media artist saw the clip, he got in touch with a curator at the Carnegie Museum of Art and they set out to get permission from the Warhol Museum’s chief archivist to search for files on Warhol’s disks. They found a bonanza of doodles and experiments, including a sketchily done recreation of the famous Campbell’s soup can, reimagined in a MS Paint kind of way.